Co-chairwomen Barri Grandey, left, of Sidney, and Kathy Husemann, of Maplewood, organize decorations for the annual Autumn Leaves Luncheon, recently. The luncheon is scheduled for Oct. 2 at the First United Methodist Church. 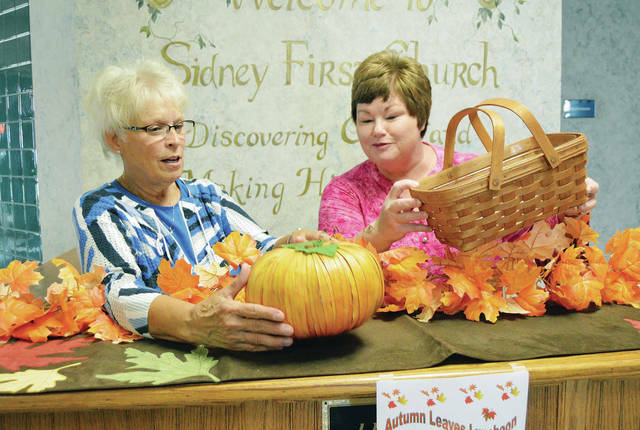 SIDNEY — The 36th annual Sidney First United Methodis Church Autumn Leaves Luncheon and Bake Sale will be Oct. 2 at noon in the church’s fellowship hall at 230 E. Poplar St.
Tickets cost $10 and are available in the church office, Mondays through Thursdays, 9 a.m. to 4 p.m. through Oct. 1. The church’s popular apple dumplings will cost $10 for four or $3 for one. Dumpling orders can be placed and luncheon tickets purchased through Sept. 28 at the church office. Barri Grandey, of Sidney, and Kathy Husemann, of Maplewood, are the cochairwomen of this year’s event. The buffet luncheon will feature more than 50 salad options and include rolls, muffins, beverages and desserts. There will be a style show by Bliss & Bloom, TC Sports and Vin & Joy. The Sweet Shop will be open before and after the luncheon, offering homemade baked goods, home-grown produce and apple dumplings for sale. Proceeds of the event will support mission projects locally and worldwide.